As you can see I have finally got around to producing my less than instant report on this seasons congress. I arrived at the club at the published opening time to be greeted by several competitors keen to be started. Great. Even better everyone turned up, so I did not have any unexpected problems with the draw to contend with. Fenton Chess club for their loan of sets. Sandra and John Blackburn, and the NSDCA, for their donations. James Rothwell for helping setting the room up. John Day for liaising with the bridge club. All those who helped restore the club to its natural state at the end of the congress. All those who found time to say kind words to me about the event. Your encouragement is much appreciated. All the players who put up uncomplainly with any imperfections on my part. Particular thanks to those who didn't win prizes - without people willing to turn out and come 2nd, 3rd, 4th ... there can be no winners. 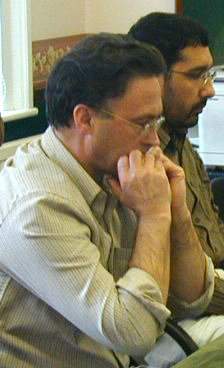 Left: Paul has a nail-biting time whilst in the background Kamal is altogether more relaxed.